2 tablespoons olive oil, approx. Bring a large pot of lightly salted water or chicken stock to a boil. I cooked mine in part chicken stock, part water to add more flavor. Add orzo pasta, cook for 8 to 10 minutes, until al dente, and drain. Note: I actually cooked my chicken in the crockpot an hour or so before putting it in the skillet. I’m always worried about not getting my chicken cooked through, so this worked out really well. I just put the chicken in my small crockpot when I got home from work, exercised, did a few other things, started cooking, then took the chicken out when I was ready for it. This recipe goes well with garlic bread and salad. Enjoy! 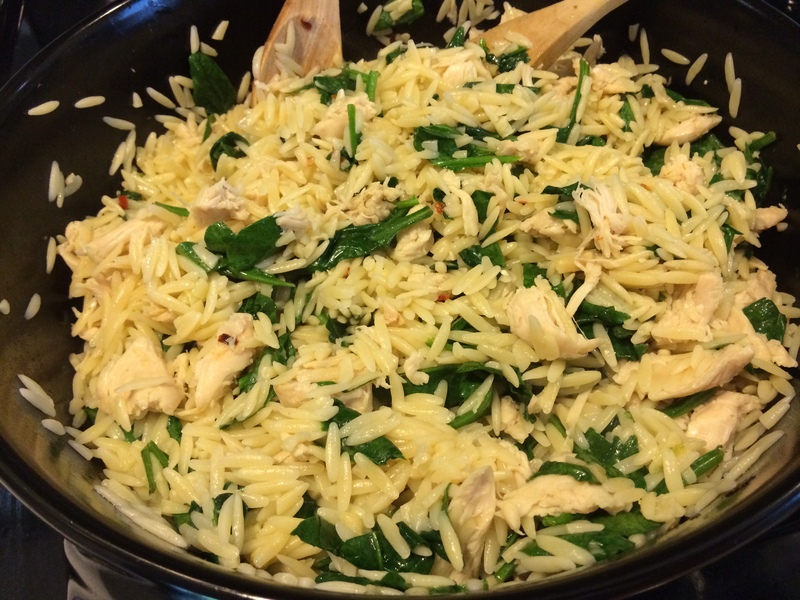 This entry was posted in Food & Drink and tagged chicken, cooking, dinner, food, garlic, garlic chicken, healthy, healthy food, kale, orzo, pasta, recipe, simple, simple recipe, spinach.